Laffy Taffy’s Story | For Animals Inc.
Laffy Taffy and her siblings were rescued by For Animals about 5 years ago. All her brothers and sisters were adopted, except her. She had an allergy and skin problems, and maybe didn’t look as sweet and beautiful as the rest of the kittens. Or maybe, she was just waiting for me… to come from a far away country and meet a For Animals volunteer so I could become a volunteer myself, visit the shelter and finally meet Laffy Taffy. Her name was Barbara, but I was calling her Laffy Taffy, like the Wonka candies. Laffy didn’t let me come close to her for a long time. I would just sit with her, and talk softly to her, until finally one day she came to me. Yes, just like that, she jumped on the bed where I was sitting with other cats. 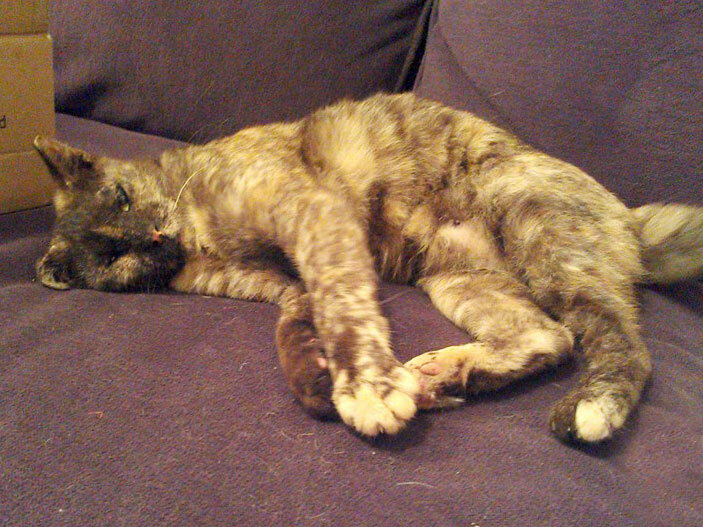 From that day forward, Laffy turned out to be a completely different cat – friendly, tender, sweet as can be! Every week when I visited the shelter I brushed her, and her skin allergy began going away without any medicine! I wanted to adopt Laffy Taffy so much but I was scheduled for a trip back to Ukraine when a weird thing happened at the airport. I picked up a lipgloss, turned it around and saw ‘Taffy Go Lucky’ on the package. It wasn’t just any lipgloss, but (OMG!) a sign for me! I cried, and I knew I was going to come back to Brooklyn and adopt her. When I returned from my trip, Laffy came home and met our 2 rescued cats. I can’t say they are best friends yet, but we’re getting there! I’m so happy to have this little miracle here with me. She loves to be around her feline roommates, still goes crazy to get her treats, sleeps on the bed with us and has her own box-castle with a pillow where she hangs out during the day. What a lovely story, it gave my Mom and I leaky eyes. Laffy sounds like a truly loving soul and I’m sure she is grateful to mew for giving her a chance and forever home. I adopted my Mom at our local shelter ten years ago and as a fellow tortie ladycat I am choosy like Laffy. I think she waited for just the right human to come along, and mew were worth the wait! Purrrrrrrrrr!!! !